My favorite part of awards season is definitely the red carpet! I look forward to seeing what each actor and actress decides to wear to each event but most-awaited is definitely the Oscars. Here is my list for best dressed females, males, and couples at the Oscars. 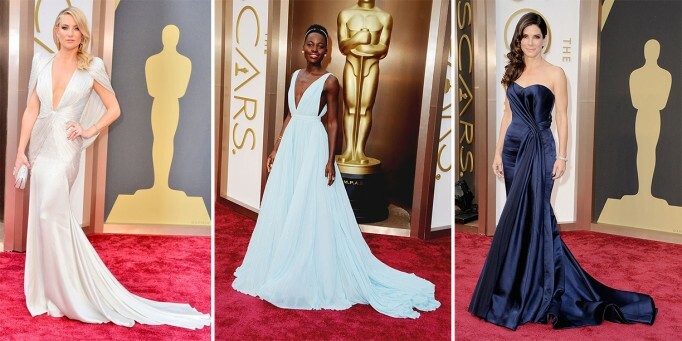 Best Dressed Females: Kate Hudson in Atelier Versace, Lupita Nyong’o in Prada, Sandra Bullock in Alexander McQueen. The peplum dess was a success on all three: Julie Roberts in Givenchy Haute Couture, Jennifer Lawrence in Christian Dior Couture, Amy Adams in Gucci. Best Dressed Males: Jared Leto in Saint Laurent, Bradley Cooper in Tom Ford, Leonardo DiCaprio in a classic tuxedo. Best Dressed Couples: Matthew McConaughey in Dolce & Gabbana & Camilla Alves, Brad Pitt in a classic tuxedo & Angelina Jolie in Elie Saab Haute Couture, Olivia Wilde in Valentino & Jason Sudeikis in Prada. Who were your favorites from last night?